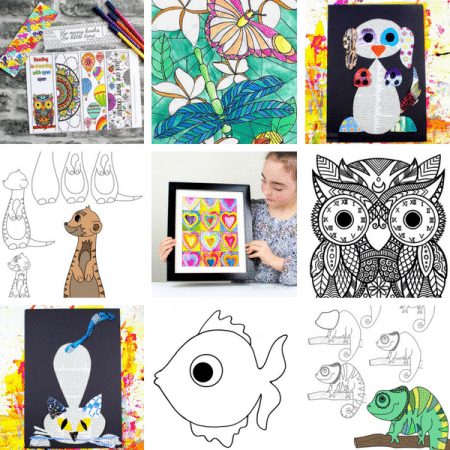 Children are naturals when it comes to Mixed Media art and tend not to care for paintbrushes or shy away from garish colour combinations. 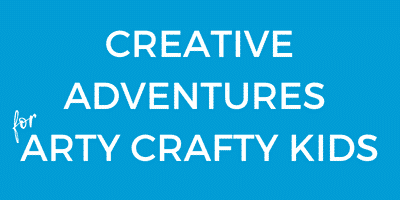 They’re natural explorers and with mixed media concepts, anything goes! 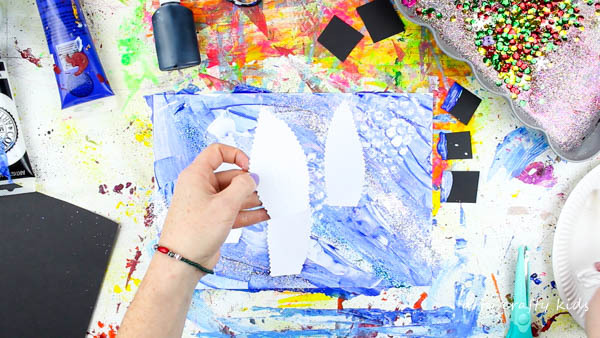 This simple Abstract Winter Art Project for Kids is perfectly suited to little artists who love to get their hands messy. 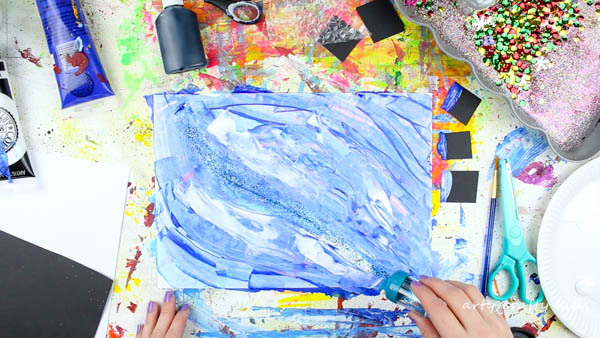 Using multiple painting techniques combined with glitter and black glue, kids will create a beautiful winter-themed piece of art that captures their unique experimental process. This post may contain links to affiliate links to recommended products. 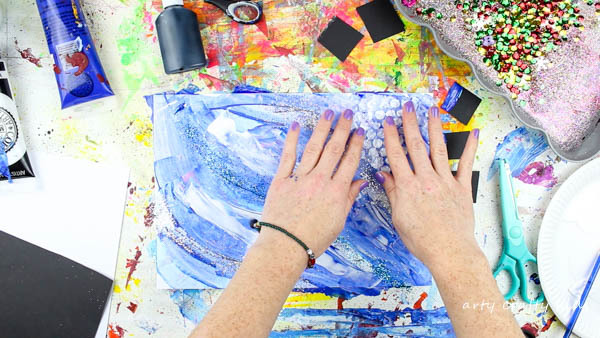 Any additional materials available in the craft cupboard – get creative! 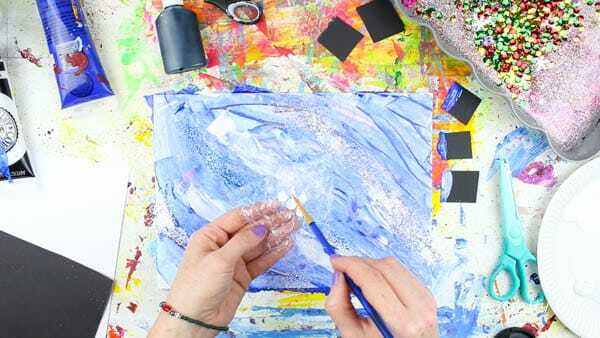 To make the Black Glue, you will need a small squeezy bottle with a fine tip. 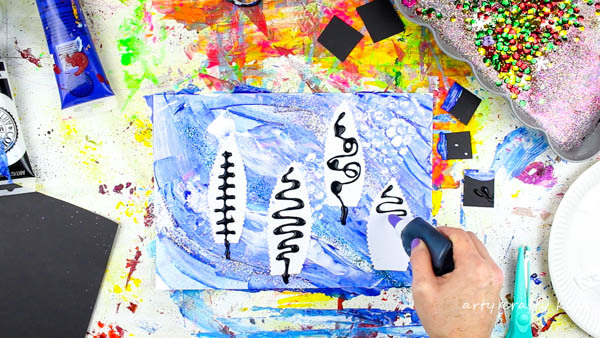 Combine 1 part Black Acrylic Paint with 3 parts PVA glue and give it a good shake! Don’t worry if the mixture appears a little grey at first, it will darken to a black colour. 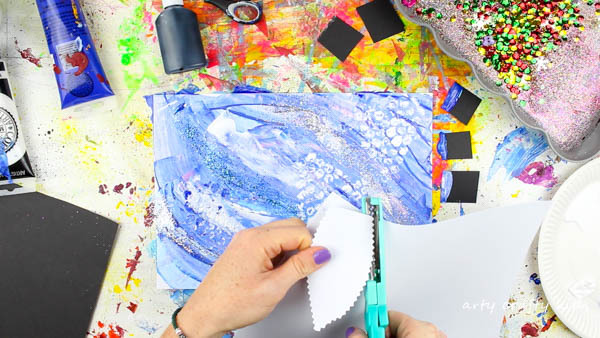 Step 1: Squirt the acrylic paint directly onto a piece of white cardstock. Cut up some scrap card and then scrape the card across the paint to spread it across the page. 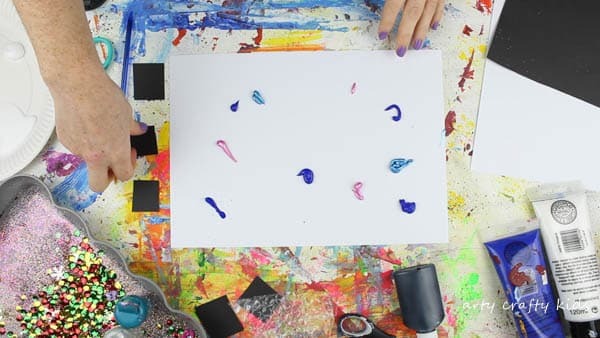 Capture different paint colours as you scrape the card across the white cardstock to merge the colours and create gorgeous blends. Step 2: Continue the Step 1 process (adding more colours if necessary) until the Arty Crafty Kids are satisfied with their new wintery canvas. Add some shimmer and shine with streaks of glitter. Step 3: (An optional extra) To add texture and depth to the landscape, use bubble wrap to create prints. Step 4: For best results, paint the individual bubbles on the bubble wrap and then press down firmly. Carefully peel the bubble wrap away from the painting to reveal the print. Step 5: Using another piece of White Cardstock, cut out multiple ‘tree’ shapes with the ‘decorative edge scissors’. Step 6: Glue the trees onto the painting. 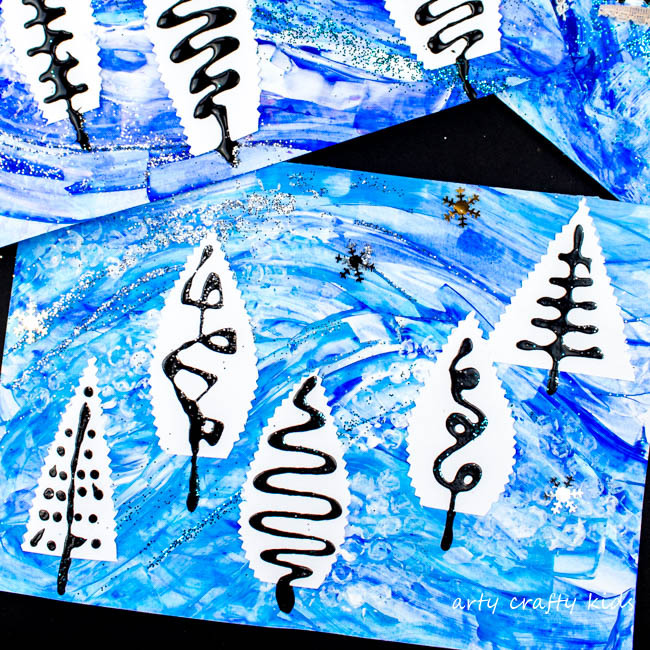 Step 7: Complete the trees with black glue, creating fun trunk shapes. If possible, apply the black glue in one free flow motion and have a piece of tissue to hand to wipe away any excess glue. 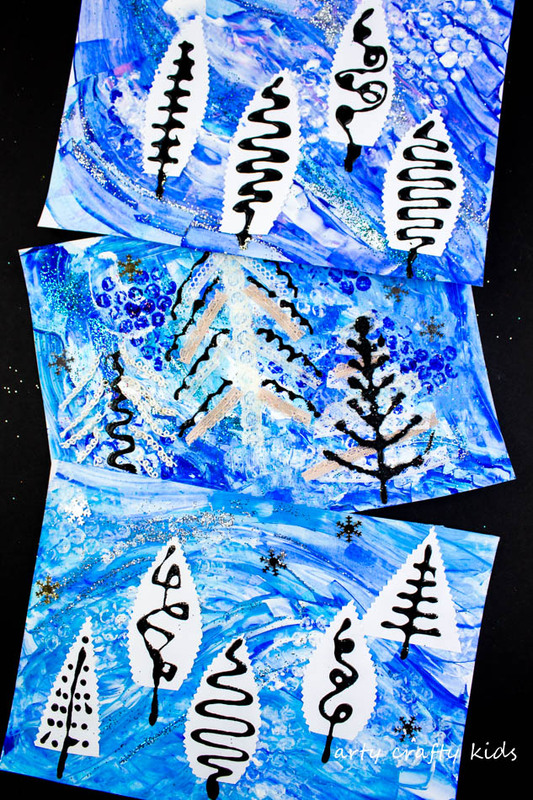 This Abstract Winter Art project can be easily adapted to suit any age and ability. For instance, the black glue could be substituted for paint or cut up black card. For one of our winter landscapes, we created trees out of white lace rather than cardstock and added snowflake embellishments. Perhaps the trees could be a gorgeous evergreen colour rather than white?